Idiomatic phrases in English rock my world, though possibly not as much as puns, which are the bee’s knees. They can be corny, even so much so as to be nonsensical, but who can’t get into them to some degree? I’ve mentioned a few times on this blog that I see the benefit of going out and observing beyond simply seeing things in space. For me, it’s also mental-floss, as I think it is for most amateurs. When I’m out there, I make sure that I take some time to stop fussing with my gear and relax, so when my eye is a few millimeters from the eyepiece, I’m calmer, I stay more still and I breathe easier. As it gets colder, this seems to make a bigger difference, for me at least. When I take those few extra minutes to get my head in the right place, I come away from the experience feeling recharged and happy. Even if I’m soaked with dew. One other activity that yields similar results, that I’m also very enthusiastic about, is motorcycling. The parallels are many. If your head isn’t in the right space, you won’t enjoy the ride, but if you take even a few seconds to let go of whatever ultimately trivial baloney is wasting your mental energy, a good ride will make it all better. I’ve been thinking a lot about how to combine the two and today I got an email ad (which I won’t call spam since I signed up to get them) from a place I’ve purchased some riding gear, Revzilla. They’re definitely my favorite online shop for this kind of thing and the ad was for a contest they’re having, where you leave a comment on their blog about what riding means to you. So, I thought about it and realized how much I would like to make motorcycling and astronomy happen at the same time. I think I found a product that can help make this happen. A hard shell backpack style case? Are you kidding me? This is no cheapo “travel-scope” either, this is a high quality instrument that is suited for astrophotography.That doesn’t mean you can’t use it for observing too though, in fact, I have zero doubt that it would excel in this department. See that red handle on the top? It has a notch in it like a gun sight, so it doubles as a finder. How awesome is that? That means one less thing to bring with you. I see this as a dual-purpose scope; you use it for visual observing as a “grab and go” scope, and you use it for astrophotography when you have the gumption to set it up on a proper tracking mount. I’m not about to even consider taking my huge equatorial mount and tripod (with 2″ diameter legs) for a ride on two wheels, so there would need to be a portable mount and tripod as well. Fortunately, I think the Astro-Tec Voyager II will fit that bill nicely. Alt-Az mounts keep it simple. I like simple. It’s under 15lbs, can support a 20lb instrument, collapses down to a manageable size and requires no electricity. It’s also half the price of some of the other non-cheapo mounts like this, but is still a solid piece of gear. This certainly won’t fit in your pocket, but the size and weight are absolutely manageable for a bike. Depending on the model, it might require some creativity to get it properly secured or stowed, but that’s half the fun. With these two things, a diagonal and a couple of eyepieces should be about all you need. That’s it, you’re ready to go. I love that idea. While I’m on this topic, I’m going to also point out a couple of bikes that I think are ideal for observing trips. Certainly there are more motorcycles than I could possibly (practically anyway) mention that would be suitable, almost ANY bike would do for the most part, from the most exotic Italian sport bike to the clunkiest American hog. The current trend in the motorcycle industry for dual-purpose adventure/touring bikes is PERFECT for people who want to ride out into the sticks at night though. They can handle crap roads, they often have long ranges (between fuelings) and offer comfort when you’re heading out for long periods. Also, most are pretty quiet, which I see as a big plus. I don’t really think it’s cool to be screaming or booming through quiet neighborhoods or back roads late at night. Loud pipes DO NOT save lives. ABS and enhancing your visibility on the road saves lives. There has been a lot of research on this subject, so don’t take my word for it. Look into it yourself if you don’t agree. Also, deer don’t care how much noise you’re making, when they run zig-zag in front of you it’s a predator evasion tactic and it’s totally random. 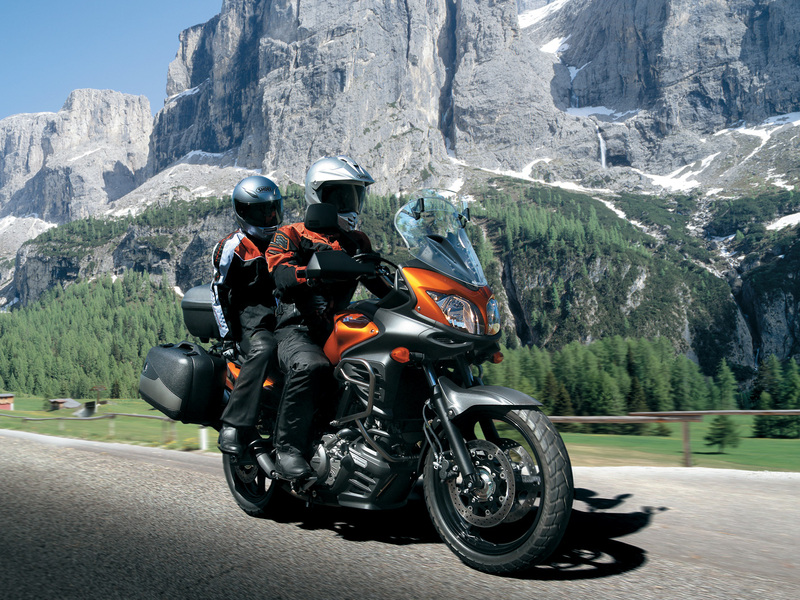 My top bike picks, because why not, this is a new product post, for 2012 would be the just-redesigned Suzuki 650 V-Strom, BMW G650GS, Kawasaki KLR650 and Triumph 800 Tiger. The KLR is the cheapest, the Triumph is the sportiest, the BMW has the best fuel economy and the Suzuki is the newest and (reportedly) most comfy. There are PLENTY of other bikes that are every bit as good (and maybe better) for this stuff, but these are the ones I like. I'm willing to bet the skies are pretty dark where they are. That’s what it said on the bumper sticker anyway.